Light a grill. Shape the meat into 4 patties and season on both sides with salt and pepper. Wrap each hamburger with 2 slices of pancetta. Grill the burgers over a medium-hot fire for about 4 minutes, or until nicely browned on the bottom. 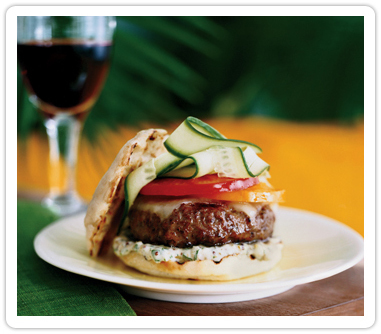 Flip the burgers and top them with the Gorgonzola. Grill for about 4 minutes longer, or until nicely browned and cooked through. Meanwhile, brush the cut sides of the buns with the butter and grill them, cut side down, until lightly toasted. Set the burgers on the bun bottoms and top with the lettuce, tomato and onion. Serve at once. Beer Beer is all that's needed between bites of this rich burgera flavorful brew, such as Catamount Gold, would be ideal.